Surrounding the city of Tromsø, in Northern Norway, is an archipelago of Islands and one of the most beautiful landscapes in the whole of Norway. High mountain peaks dusted with snow, colourful hamlets, busy harbours and quiet coves add to the drama of an environment where nature dominates. 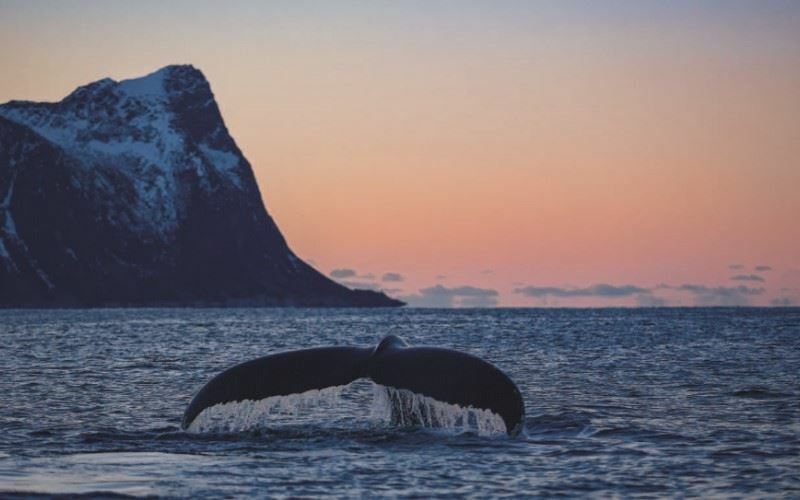 Many people visiting Northern Norway during the winter months do not venture far from the towns and therefore miss the opportunity to witness this wondrous scene, however, on this tour you will be an exception to the rule. Sunday: On arrival at Tromsø airport, you will be transferred to the Clarion Collection Hotel Aurora in Tromsø. Clarion Collection Hotel Aurora, Tromso. Situated on the harbour front in Tromso, the Clarion Collection Hotel Aurora combines panoramic views with a friendly, relaxed service. Monday: Today, after breakfast you will transfer by catarmaran to Finnsnes and then on by road to the island of Senja. A true gem along the Norwegian coastline Senja is also home to a National Tourist Route, designated as such because of the scenery it unveils. Your destination is Hamn I Senja where you will arrive in time for lunch. Your accommodation at Hamn I Senja is a one bedroom suite with the most beautiful, uninterrupted sea views. Afternoon waffles and an evening meal is provided at the hotel. The suites also have their own kitchenette for your convenience. Hamn I Senja, Tromso. One of the most beautiful roads in Norway, follows the coastline of Senja island from Botnhamn to Gryllefjord, passing through the village of Hamn. Tuesday: After breakfast, you will join a wildlife safari by boat (2 hours). Following the coastline the tour provides the opportunity to observe sea birds - including sea eagles and cormorants - as well as the chance to see seals and even whales (December to the beginning of February). When Sunvil Discovery took part in this tour in January we saw Fin Whales, whilst Orcas were observed in the sheltered harbour overlooked by the suite at Hamn I Senja. Humpback Whales can also be spotted in these waters during the winter months. Lunch and an evening meal are enjoyed at Hamn I Senja. In the evening take a stroll to the lighthouse on the promontory by the hotel. With uninterrupted views to the north, the lighthouse is a comfortable place to relax whilst waiting for the displays of Lady Aurora. Wrap up warm so that you can sit peacefully on the rocks enjoying the show. Wednesday: Arctic bathing experience (optional) and Evening mountain walk: After breakfast, you have the opportunity to participate in an Arctic bathing experience (not available in January). Armed with a flotation suit, you will be transferred to a tidal channel where you can bathe in the Arctic waters and float on the tidal currents. It is an activity (2-hours) which will immerse you in the nature of the area and can be pre-booked or payable locally (c.790NOK). Afternoon at leisure, lunch and evening meal at Hamn I Senja. In the evening, your local guide will take you on a hike to the summit of Mount Sukkertoppen. From the top there are delightful views over the property, the island and out over the Norwegian Sea. This is also the perfect spot from which to observe the Northern Lights if they are dancing in the skies overhead. Thursday: After breakfast, you will be transferred to Tromsø. Your transfer will take you to Finnsnes by land (shared transfer) and then by Hurtigruten from Finnesnes to Tromso (3-hours). On arrival in Tromso, self transfer to the Clarion Collection Hotel Aurora. Friday: After breakfast, you will be transferred to Tromsø airport for your return flight home. Alternatively, extend your stay in Tromsø and participate in a range of winter activities including dog-sledding, snowmobiling, reindeer sled excursions and Aurora hunts. Situated on the harbour front in Tromso, the Clarion Collection Hotel Aurora combines panoramic views with a friendly, relaxed service. Situated on the harbour front in Tromso, the Clarion Collection Hotel Aurora combines panoramic views with a friendly, relaxed service. From its rooftop Jacuzzi and relax area, you can see the Arctic Cathedral, Hurtigruten pier and Tromso harbourfront. This hotel is ideal for couples, families and friends. Its atmosphere is sociable and lively, with plenty of space for guests to relax, unwind and chat about their experiences. Parking nearby c.150NOK per night. Winter activities available click here for more information. One of the most beautiful roads in Norway, follows the coastline of Senja island from Botnhamn to Gryllefjord, passing through the village of Hamn. One of the most beautiful roads in Norway, follows the coastline of Senja island from Botnhamn to Gryllefjord, passing through the village of Hamn. Designated as a national tourist road, dramatic views are visible at every turn and none more so than the panorama of the ‘Devil’s teeth’ rock formation at Tungeneset and at the Bergsbotn viewpoint over the Bergsfjord. On the west coast of Senja, with a backdrop of towering mountains and the ocean as its neighbour, the location of Hamn I Senja is nothing short of idyllic. From the apartments guests can enjoy views of the bay and from the small lighthouse, owned by the property, uninterrupted views of the surrounding mountain peaks and fjord are visible - the perfect spot for sightings of the Aurora Borealis and Midnight sun. There is also a panoramic restaurant with waterfront terrace, sauna and hot tub. This is a destination for nature lovers and photographers. Activities including guided hikes and snow shoe tours, kayak and body rafting, sightseeing boat and minibus tours, and wildlife boat excursions (potential whale watching sightings - January) can be arranged locally. Aurora evenings are also offered in the lighthouse, away from artificial lights.